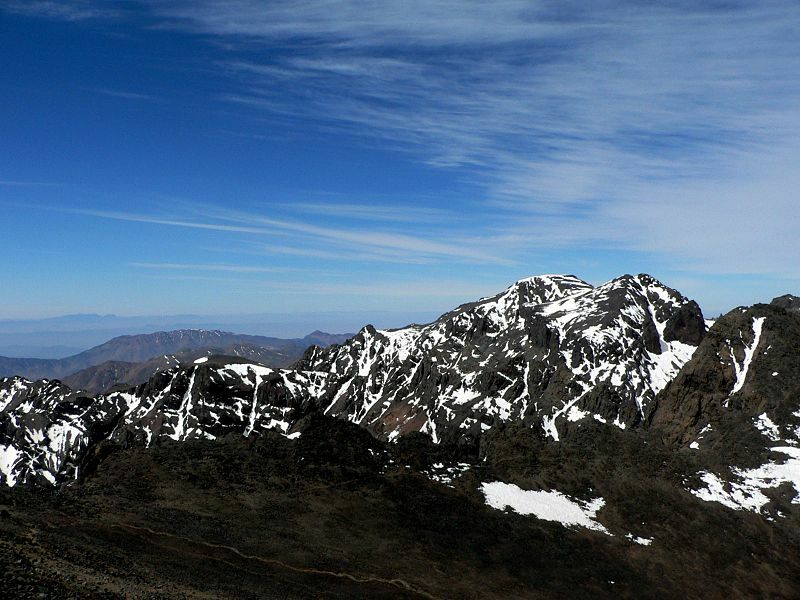 Today it was planned to take the train from Casablanca to the town of Oued Zem at the foothills of the High Atlas Mountains from where we could then do a spot of mountain walking. We enquired at the station yesterday about train departures to Oued Zem and we understood that the train would depart at 7.30 in the morning. Arriving at the station and enquiring about which platform the train was leaving from we were told there is no train this morning, it leaves at 7.30 tonight. 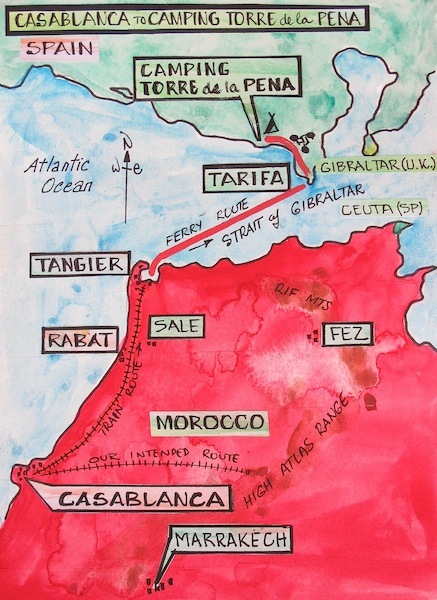 Bev and I looked at each other and said ‘what next?’ Do we hang around Casablanca all day then take the night train or return to Tangier and catch the ferry back to Tarifa in Spain? We chose the latter as arriving in an unfamiliar town or city in the dark was not a suitable option. 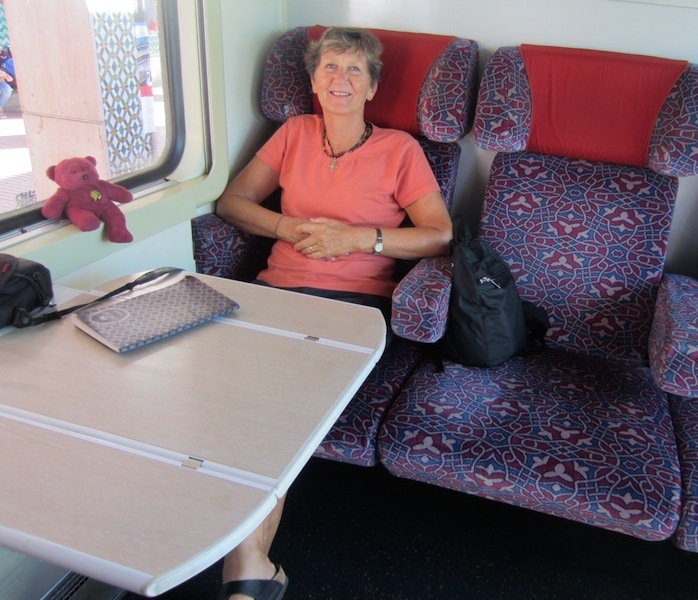 The train for Tangier left mid morning and soon after settling into the allotted compartment we came to the conclusion we had made the right decision. When boarding trains the procedure is for Bev to find our designated seat and if it’s on the platform side I stay outside and clean a portion of the window. Having a clean window section means I might be able to get some reasonably clear photographs. If the seats are on the off side I clean a section in the door window on the station side. Cleaning the Casablanca to Tangier Express window. Our compartment on the Casablanca to Tangier Express. 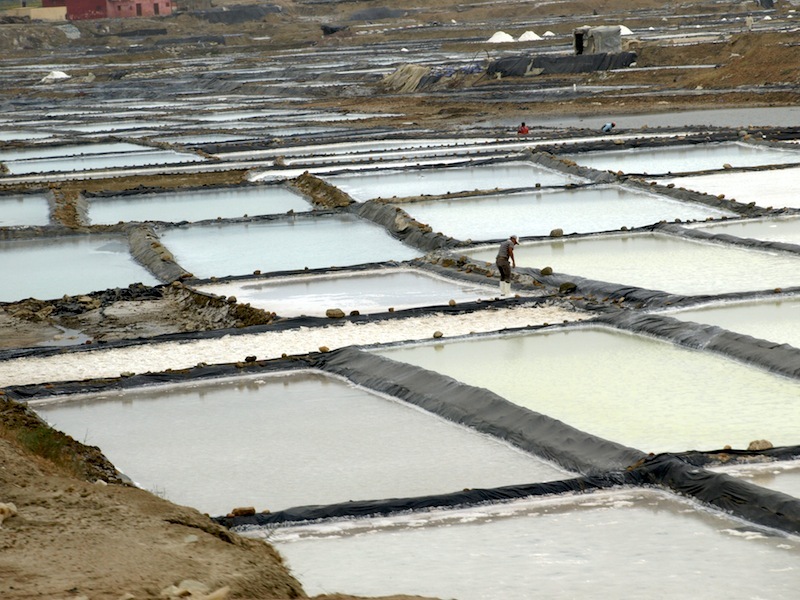 Salt evaporation ponds along the way, a reasonably clear image taken through the train window as we sped towards Tangier. The Casablanca to Tangier Express is not a designated a high-speed train but it wasted no time in getting between the two destinations. Fortunately we were in the rear carriage and it was possible to look out the back door of the train. Speeding around a curve, from the rear of the train. Note the camber in the line. 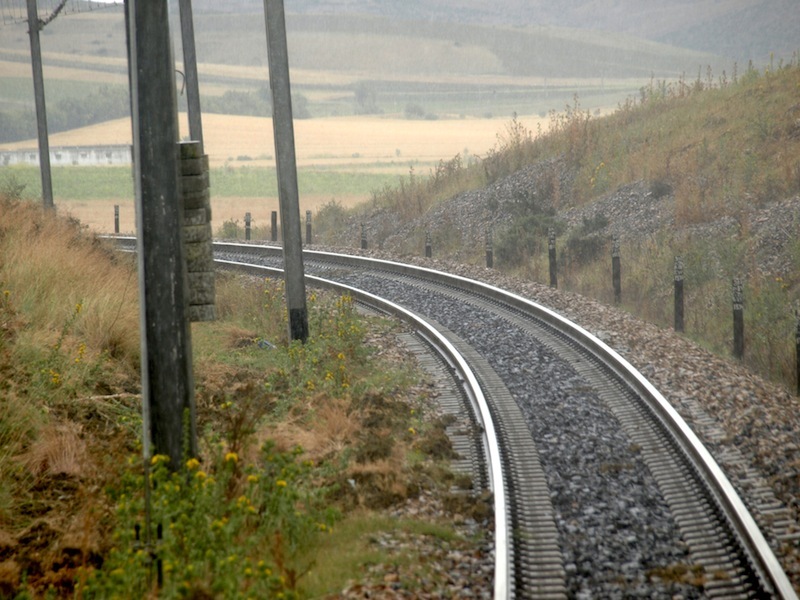 A camber like this allows the train to speed around corners without jumping off the rails. 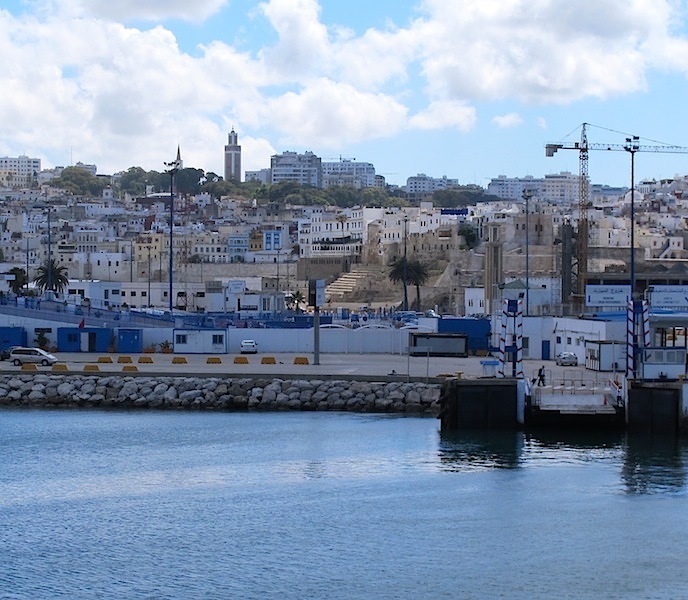 The rail route between Casablanca and Tangier mostly follows the coast and as usual with coastal strips in the region they are being developed to cater for northern European tourists. Many hotels and apartments similar to the one shown in the following photograph are cropping up. 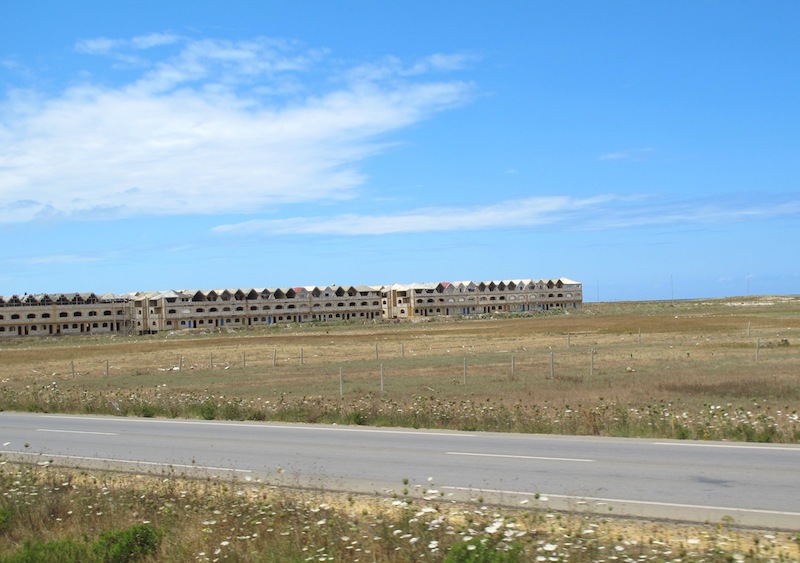 A housing development along the coast. 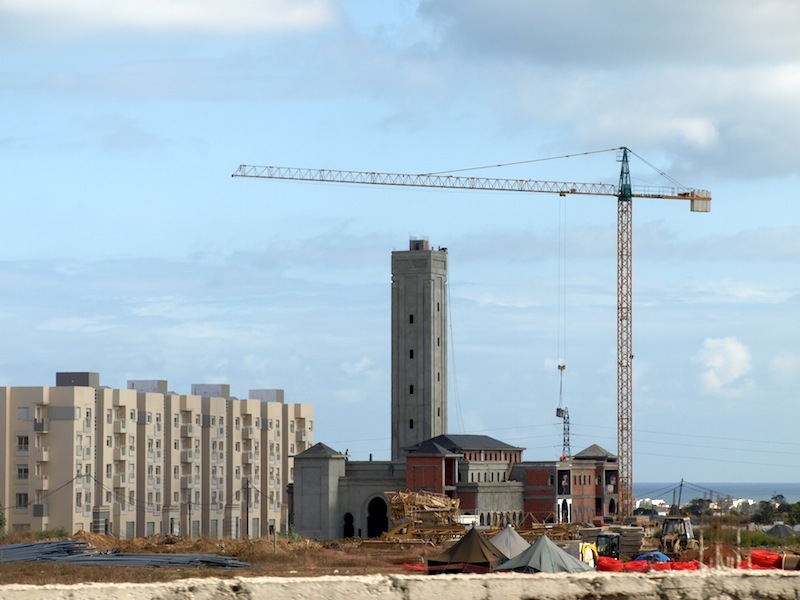 I suspect the tallest building in the above image is a minaret for a new mosque. The tents in the foreground are no doubt worker accommodation. 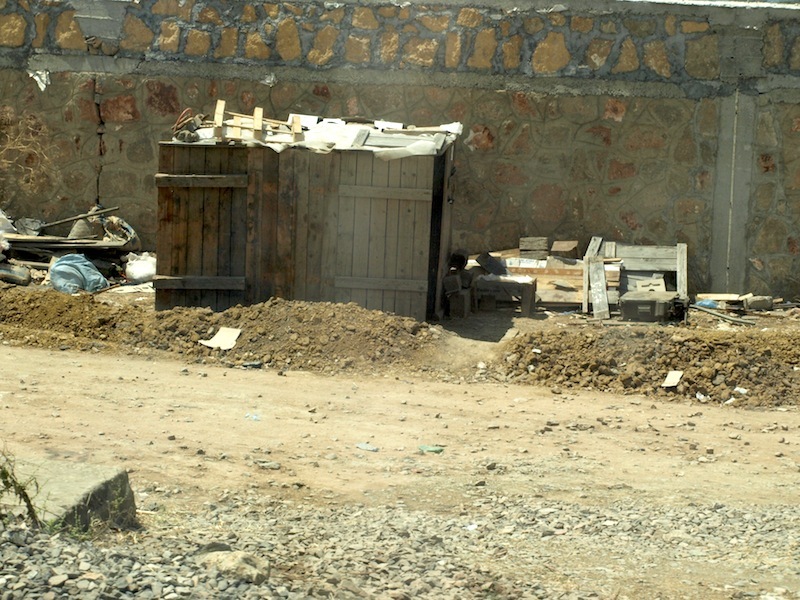 All over Morocco it appears many construction workers live on the job and the quality of the accommodation varies from good tents such as those above to shacks thrown up from scrounged materials. A makeshift shelter adjacent to the railway line. 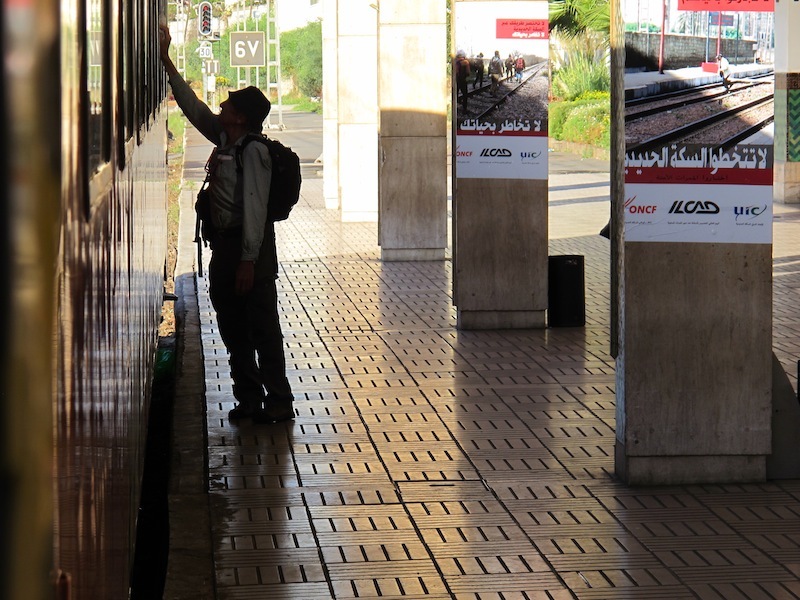 When travelling by train in Morocco there is no time for snoozing, as there are many things to see and curious happenings not to be missed. Following are a few quick observations. Some have no conclusion, I put them up for the entertainment. 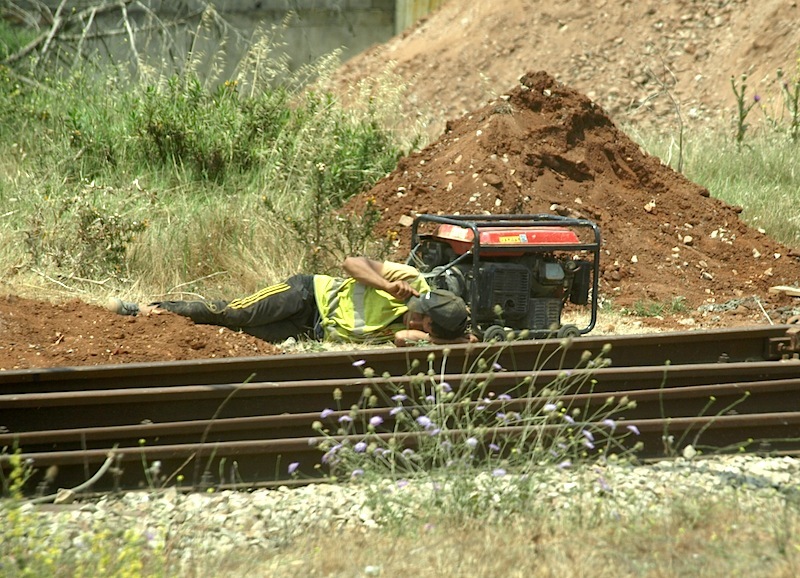 A worker in prone mode, minding the generator and having a chat on a mobile phone. At one point today the train came to a halt and our window was next to a group of men mixing concrete for a railway abutment. 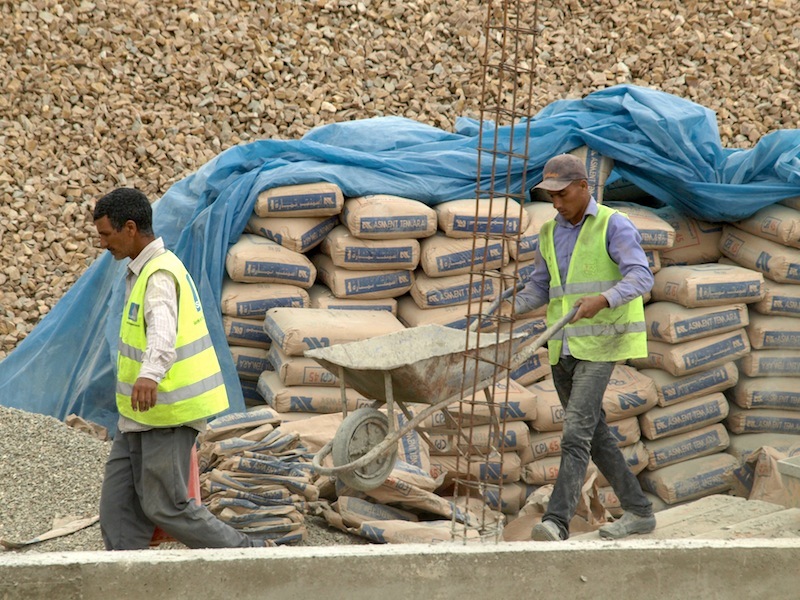 One of the workers realised I was taking photographs so he exaggerated his performance for the camera. Filling the wheelbarrow with gravel. Having the wheelbarrow on its side meant the superman worker didn’t have to lift the shovel full of gravel up and over the edge of the barrow. When it was half full he stood the wheelbarrow up and filled it to the top, saving time and effort. The shovel placed back in the sand. 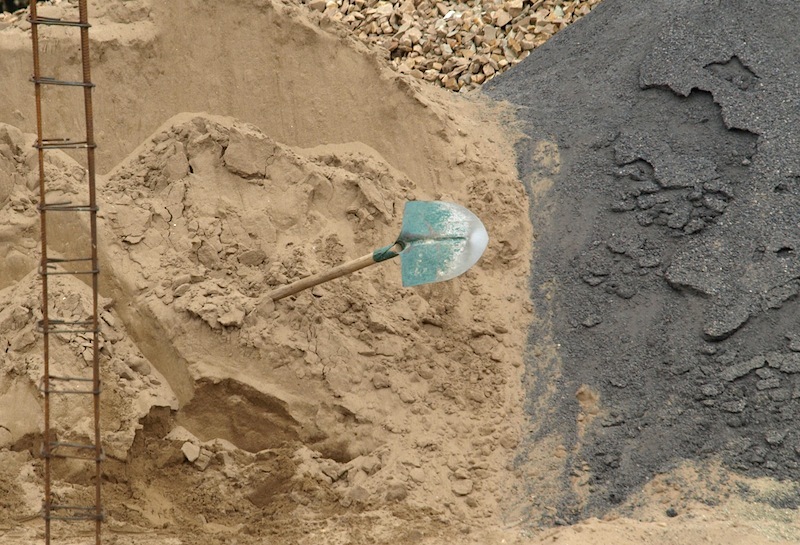 After filling the wheelbarrow with gravel the superman mixer threw his shovel back into the sand heap. 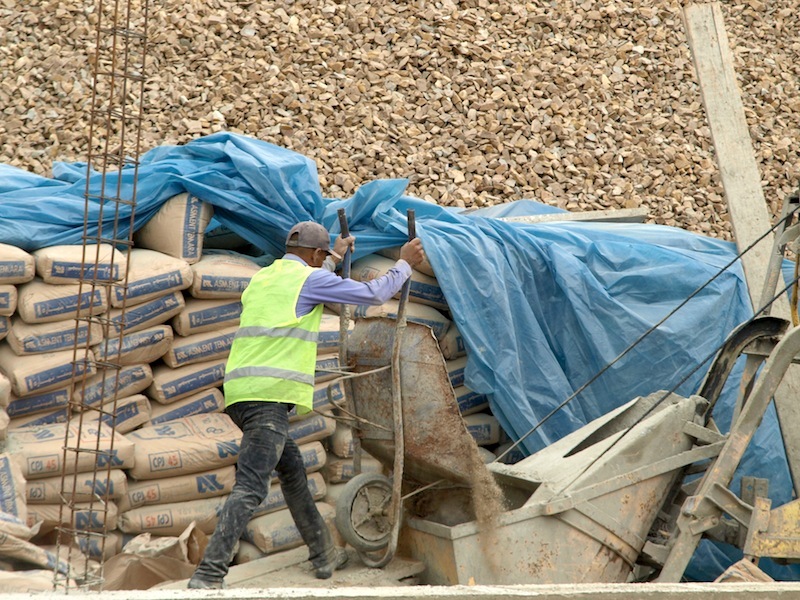 The shovel standing up meant it saved him bending over to pick it up when he returned for the next load of sand. Next, the wheelbarrow contents went into the concrete mixer hopper. The next manoeuvre (following photograph) was efficient and entertaining. The wheelbarrow in midair. The wheel is just under a metre off the ground. 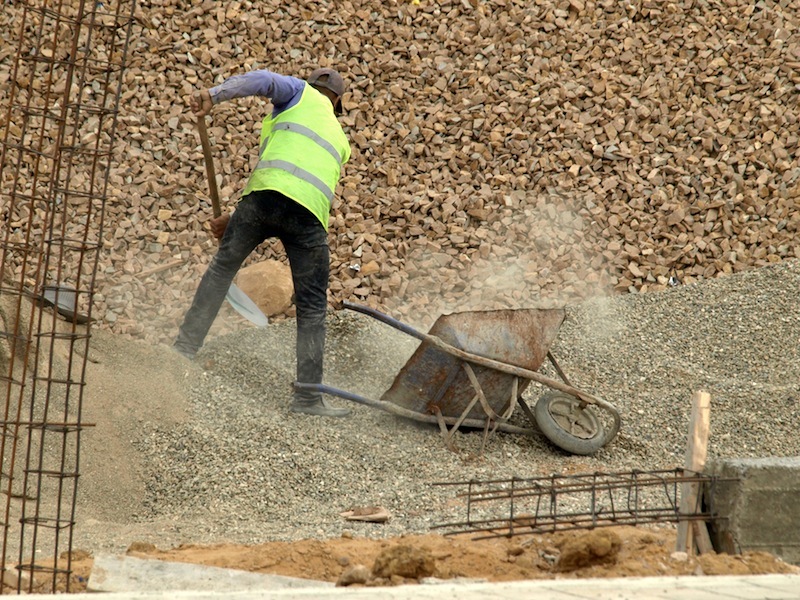 After the contents of the wheelbarrow were emptied into the concrete mixer hopper the superman mixer swung the empty wheelbarrow up into the air then through 180 degrees and it landed back in the direction of the gravel heap. It really was an entertainment to watch, like a choreographed performance. There is an Australian dance group called Tap Dogs and their performances revolve around dancers using industrial items to make rhythm. Using things like brooms, shovels, oil drums, dust bins and lids and the steel taps on their boots they produce some incredible movement and sound. I think the concrete mixer’s performance I witnessed today could easily be turned into a stage show. There are a number of YouTube presentations showing Tap Dog performances and if you have a look you might easily imagine them swinging wheelbarrows in a routine. Even on the train there were things to see. 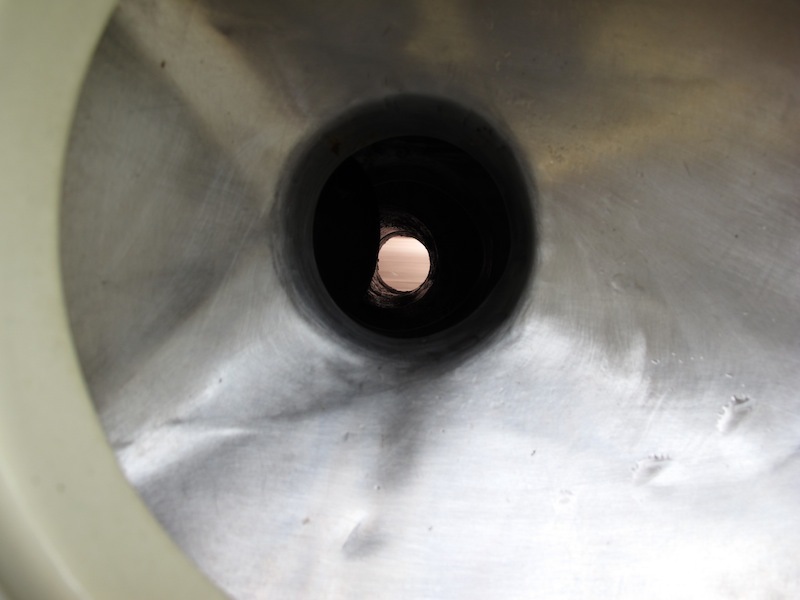 The following photograph might be considered bad taste but as I looked down the toilet bowl tube watching Morocco speed by below I couldn’t help thinking of the phrase “going down the tube”. A common phrase in Australia is ‘down the tube’, meaning something that can’t be retrieved or an action that leads to the decline of a business or country’s government. An example of its use is: ‘the country is going down the tube since the last change of government’. Greece at the moment could be said to be ‘going down the tube’. A variation is ‘down the drain’ and the English version is ‘down the pan’ referring to toilet bowl pipes. 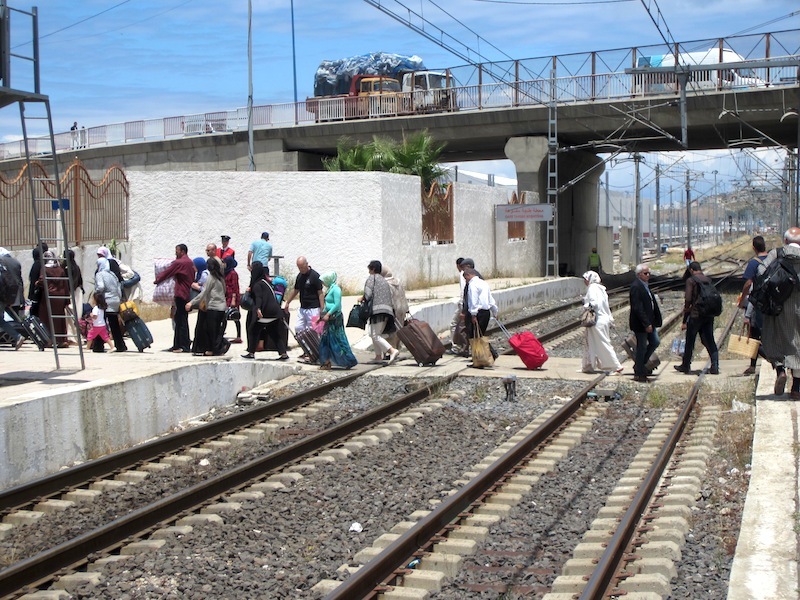 Passengers of the Casablanca to Tangier express arriving at Tangier railway station. 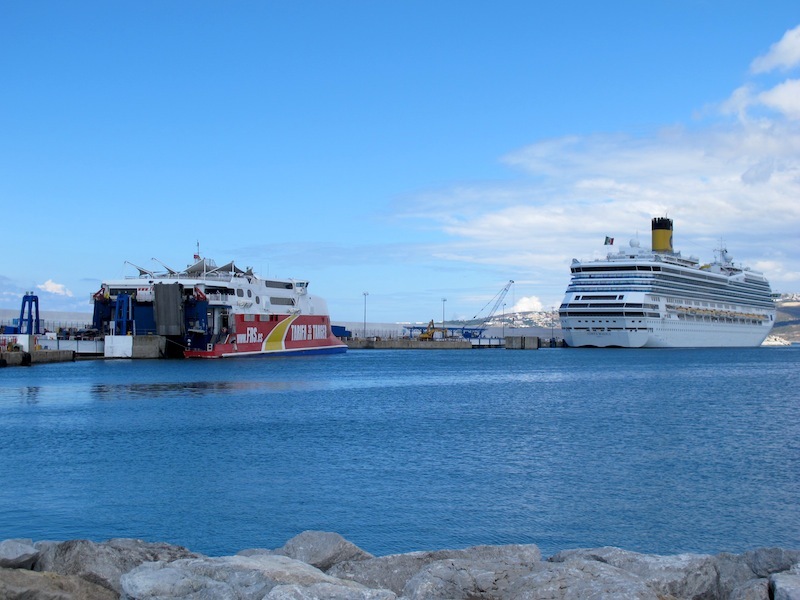 It is a short taxi ride from the railway station to Tangier Ville port from where the ferry goes to Tarifa in Spain. Once in Tarifa we returned to Camping Torre de la Pena to collect our bikes and continue our travels in Spain. Tangier Ville port. Our ferry on the left and a cruise ship on the right. Farewell Morocco. Looking back towards the Tangier medina. The Hotel Continental, which I wrote about in the Tangier posts, is in the middle of the photograph. It’s the building with the multiple arches and the lone palm tree out the front. 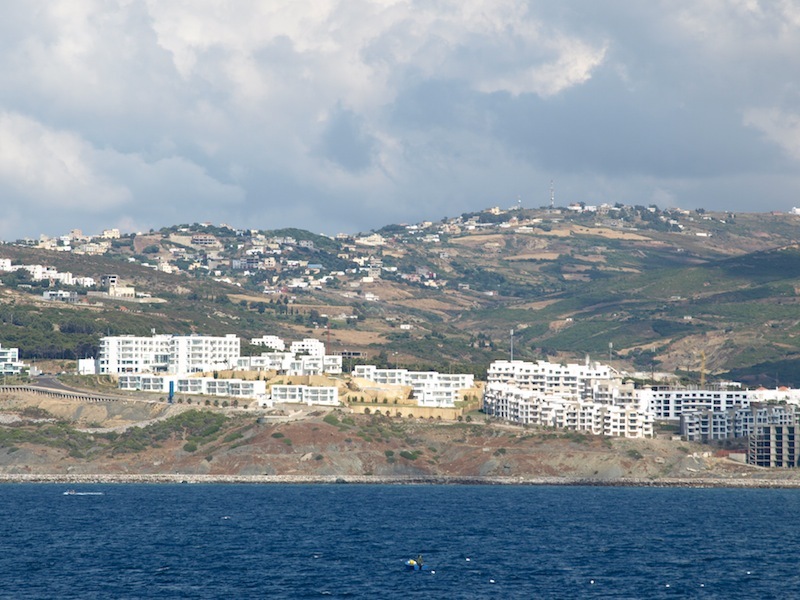 View of the Tangier urban sprawl (new Tangier) from the ferry as we headed for Tarifa. Bev and I enjoyed Morocco immensely. It took us 42 years to cross it off our bucket list but we did it. There are people who do not like Morocco and I suspect it’s because they probably have a delicate nature and find it difficult to cope with its culture. Some passengers on cruise ships that call refuse to go ashore, preferring the confines of the ship. Others who do venture ashore dislike the food or being hassled by touts. There is no doubt some people have had bad experiences, such as being accosted, but that can happen anywhere in the world, mugging is not confined to Morocco alone. That said, there are areas within Moroccan towns and cities where it is unwise to venture and it pays to find out where these areas are. On one occasion, unbeknown to us, Bev and I were heading into a no go zone and a couple of locals suggested we didn’t go there. The Moroccan people were friendly, the food was delicious and the ancient medinas were mesmerising. We managed no ‘revenge’ events such as stomach upsets and we weren’t abused, we enjoyed it all. Thanks Morocco. Back on Spanish soil the first thing we had to do was to collect my Leatherman where I left it before departing for Morocco. Next was a taxi to Torre de la Pena Camping for an overnight stay and to collect our bikes. That’s the end of another post or should I say, reflection. The next post will take us on to Cordoba in Spain. Hope you stay with us and if you haven’t already clicked on follow do so and WordPress will alert you each time we do a fresh post. For a little extra entertainment read some of the comments and leave one if you wish. I LOVE this blog! Windows cleaning, toilet view and thoughts, places of interest explained…men, women, LIFE everywhere…amazing. Thank you so much! Thankyou for your comment re I Love this blog! Window cleaning……. It is good to know that there are lovers of the blog out there, it keeps us going. As you know we are back home in Australia and tomorrow we are heading for Thursday Island (far north of Australia) for our eldest son’s birthday. I wrote about Thursday Island during part 2 of the is odyssey (search Torres Strait if you want to read about it). I am running a long way behind with my writings but slowly catching up. I will soon be writing about Beziers one of our favourite towns.